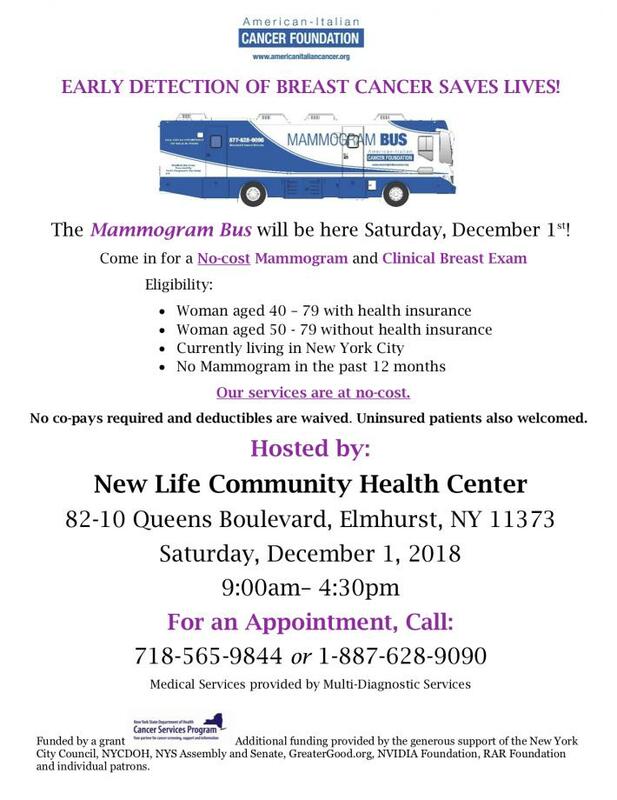 New Life Community Health Center is hosting a mammogram van on Saturday, December 1 from 9 am to 4:30 pm. Mammogram screening is the best early detection of breast cancer and early detection is critical for effective treatment. You MUST sign up in advance for an appointment. You can either email Kristin Moltz at moltzk@nlchc.org or call and leave a message at the health center (718) 565-9844 (ignore the incorrect date on the voicemail message). Please see the flier below and pass along the information to anyone who might be interested. This is for BOTH those WITH insurance and those WITHOUT insurance and there are NO COPAYS.